Rajma, or, Red Kidney beans curry, is one of the most popular comfort foods in northern India. Red beans are cooked in a traditional Punjabi onion-tomato curry and seasoned with toasted garam masala. This vegan and gluten-free soul-food is best enjoyed with a bowl of steamed basmati rice. Beans are a staple food in so many cultures around the world. They’re nutritious, contain protein as well as fiber. They’re widely available, inexpensive, and above all, almost every culture has a comfort food version including beans. In northern India, a popular rustic combination of Red Kidney Beans and Rice is called Rajma Chawal, where Rajma refers to any variety of kidney beans, and, Chawal means rice. 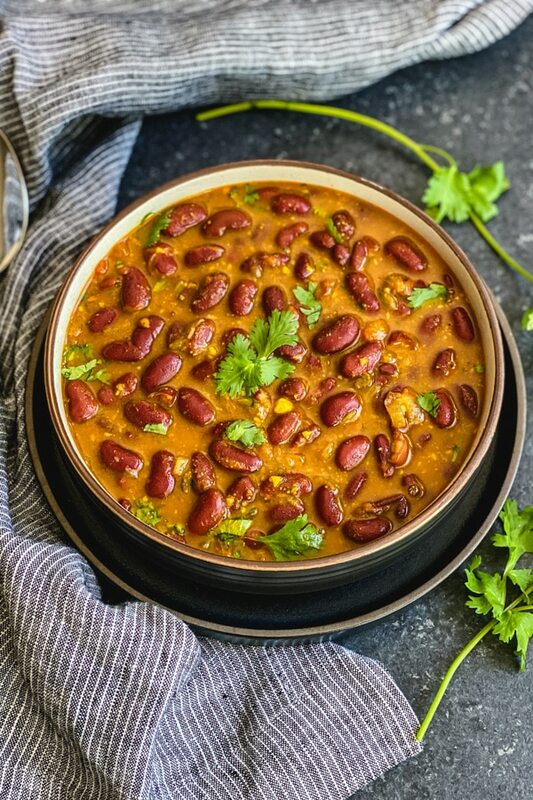 This dish, Instant Pot Rajma Masala, is very close to my heart as it represents my Punjabi roots, and has countless childhood memories attached to it. I have been making Rajma Masala for decades now. 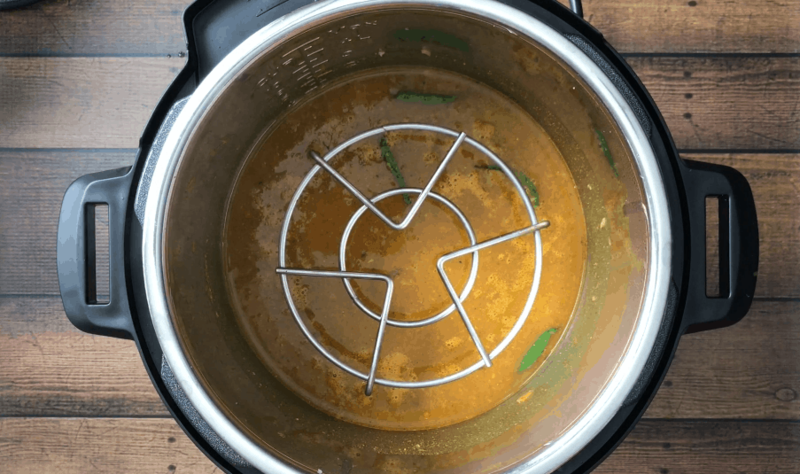 9 out of 10 times, I make this curry recipe with dried beans that I soak overnight. I follow my Mom’s recipe, with a twist. My mom makes Rajma in a 2-step process. She boils the Rajma with salt and turmeric first . Then, she prepares an onion-tomato-masala (tempering), and simmers the cooked rajma in that for a few minutes. I love her kidney bean recipe, but wanted to simplify it and make it a one-pot meal. So, I tweaked her recipe to get the best of both worlds. I start by soaking the beans overnight, to rehydrate them. Using my Instant Pot’s ‘Saute’ feature, I prepare a classic Punjabi masala by sautéing onions, ginger and garlic. Crushed tomatoes go in along with garam masala and other warm Indian spices. I add the drained beans with fresh water, and pressure cook them. And, the result is rich, creamy and delicious Rajma Masala! There are many varieties of kidney beans, mostly distinguished by color and region, and where they’re grown. My favorite type is dark kidney beans. When I have time to plan ahead, I soak the dry kidney beans the night before. Then, I cook these rinsed and drained beans in a mildly spicy, tomato based curry, seasoned with warm Indian spices. , which cuts the cooking time in half. For weeknights, using canned kidney beans and crushed tomatoes in the same recipe, makes this comfort meal possible in 5-6 minutes of cooking time. 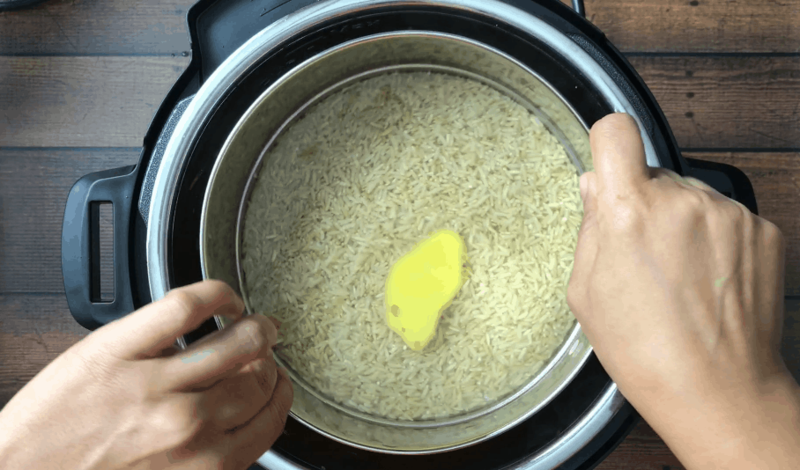 In the same amount of time, you can cook white Basmati jeera rice, Brown rice or quinoa to go along with the meal. 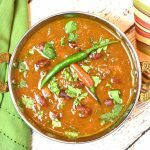 You can cook this Rajma Masala curry along with rice, using the Pot-in-Pot technique, all in the same pot. The cooking time of dry kidney beans matches that of brown rice, so they can both be cooked in the same pot. 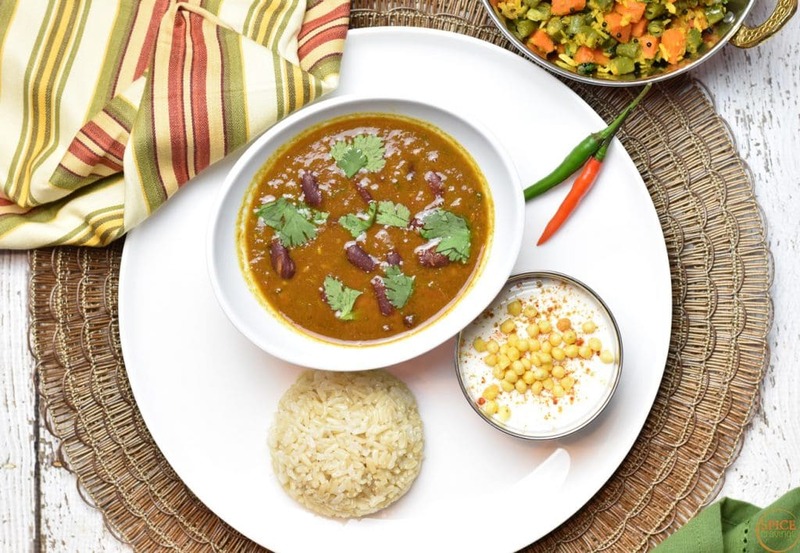 Here is the recipe for PIP Rajma Masala & Brown Rice. If you’re using canned Kidney beans, you can pair that with white Basmati rice. This recipe is very versatile. If you have a favorite way of making Kidney Beans, you can simply use this recipe as a guideline and use your spices! Rajma, or, Red Kidney beans curry, is a popular comfort food in northern India. 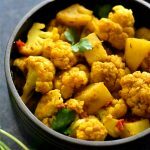 This vegan & gluten-free soul-food is best enjoyed with steamed basmati rice. Prep: If using dry kidney beans, rinse and soak them overnight. Drain them before use. Chop onions and crush ginger-garlic. 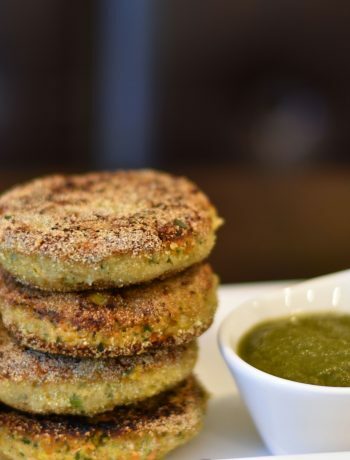 You can do that by pulsing them together in a mini food processor. Puree tomatoes if using fresh. Turn the instant pot on SAUTE mode, adjust to more. Wait 30 seconds and add oil/ghee, cumin seeds and green chillies. When the cumin seeds begin to sizzle (a few seconds), add chopped onions and crushed ginger-garlic. Saute for 30 seconds. Add crushed tomatoes and all spices, saute for 30 seconds. Add drained kidney beans and water and stir. Close lid, Valve set to sealing. Set Manual or Pressure Cook for 25 minutes, NPR (natural Pressure release). Open lid after NPR and garnish the Kidney Beans curry (Rajma) with chopped cilantro. I made this tonight but did not use my Instant Pot, simply because I used canned beans and wanted the extra simmer as I made my bread. I also left out the cayenne to suit my taste but otherwise made with the ingredients and measurements stated. The taste was spot on. Loved it and will make again. Hi Pamela, that is awesome! I’m glad you customized the recipe to your liking. Thanks for sharing your feedback! 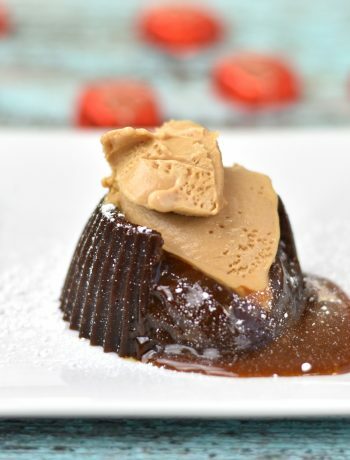 If you haven’t already, please click on the stars and rate the recipe, it helps other readers! Thanks much!